Layla is looking for a forever home. 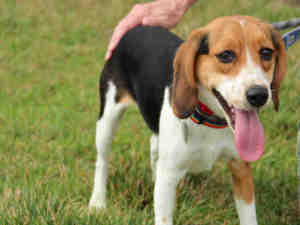 She's a spayed female, tricolor Beagle who is about one year old. Just look at that happy face and wagging tail! Layla's a beauty! Right now she's living at the Humane Society of Missouri Chesterfield Valley animal shelter, but she'd much rather have some fun with you and your family. Our first pup was a beagle - they are awesome dogs. And she is such a cutie! Hope she gets a furever home soon! !